There's a lot to recommend on this DVD. The version of "Layla" here is for my money the absolute best live version of the song available anywhere. Clapton's tone is rich and deep, his singing is energetic and passionate, the band lay down a great driving beat, and the solo is beautifully melodic and powerful. The version of "Holy Mother" present here is also a career high, easily besting the studio recording. It's also fun to see Phil Collins do "In The Air Tonight." Overall the band is in great form. My gripe is that there isn't more! The entire concert was recorded (I know, I have the bootleg) and there were more gems than are on display here, including a great version of "I Shot The Sheriff" and it would have been nice if maybe some more of the concert had appeared on DVD, if only as a special feature. Beyond that, highly recommended. This DVD is great "Crossroads" outstanding third solo. "Miss You" great drumming by Phil Collins. "Layla" very great "Thorn Tree In The Garden" end and Phil Collins with "In The Air Tonight" just too great for words. 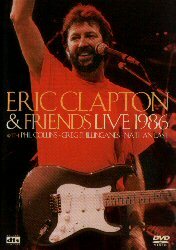 Outstanding DVD to any Clapton collection.